Melding furniture design with formal art practice, functional with sculptural, Seattle-based artist Roy McMakin challenges the segregation of art and design, an investigation that has occupied his practice throughout the last twenty-five years. In a small show of paintings with chairs & sculptures of chairs—currently on view at the Portland Art Museum as part of the new APEX series organized by Curator of Northwest Art Jennifer Gately—McMakin continues his inquiry into the intersection between art and design. Using a generic-looking chair of his own design, appropriately deemed the Simple Chair, McMakin here situates his furniture design within a more conceptually rooted art practice through the most minimal alterations. While design has held particular interest for a number of 20th and 21st century artists—think Isamu Noguchi's lamps or Donald Judd's lesser known furniture designs—it is only in recent years that there has been a more widespread acceptance of functional design into art practice. A younger generation of artists like Jorge Pardo and Tom Sachs reject the kind of rigorous separation of art and design that Judd endorsed, instead adapting a more inclusive stance. Similarly, younger designers such as nendo's Oki Sato—who was in Portland as part of the Tokyo Design Symposium earlier this year—adopt design strategies that share striking similarities with contemporary art practice. Working concurrently as an artist, furniture designer and architect, McMakin frequently pulls from one practice to inform the other, maintaining a continuity across disciplines. 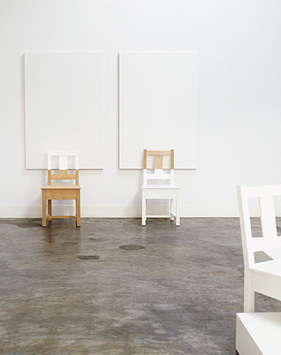 In two of the works in the exhibition at the Portland Art Museum, McMakin pairs chairs with monochromatic paintings. In one untitled piece, a set of paintings are paired with two chairs sitting alongside one another. On one chair, the top half is painted white, as if in a feeble attempt to make the chair disappear against the monochrome painting that it sits in front of. In the other, the bottom half is painted white, blending in with the neutral tones of the gallery wall, while the top half is left exposed, creating a formal composition with the panel behind it. In another untitled work, a maple chair is situated in front of a monochromatic panel painted in the same warm hue of the chair. In these pieces, McMakin clearly locates his chairs within the space of the gallery by playing with the formal relationship between objects, planes and spaces. In the two other works in the exhibition, McMakin more overtly explores the formal relationship between his work and the vernacular of the white box, casting his furniture as sculptural objects by pairing them with pedestals. In one piece, a chair rests several inches off of the ground on a low pedestal, placed at an angle in one corner so that the pedestal itself becomes yet another interesting scuptural form to consider. In another, less successful, piece, McMakin deviates from the tight formality of other work in the show, constructing a chair that theatrically appears as if it is emerging from (or perhaps sinking into) the low pedestal on which is is displayed. McMakin's pairing of chairs with wall-hung paintings brings to mind Joseph Kosuth's One and Three Chairs, but McMakin's chairs clearly do not share the same concern for purity of concept as the work of early conceptual artists do. McMakin is not afraid of the associations that these domestic objects conjure within the gallery space, and he equally embraces his role both as a sculptor and a designer. McMakin's chairs are not found objects, but works of his own design, built by the small workshop that he runs to fabricate his line of production furniture as well as component parts for his sculptural work. Although designed with simple, strong lines and impeccably assembled and finished, McMakin's works do not attempt to look industrial. McMakin is interested in isolating the formal elements that differentiates art objects from functional objects, but he does not entirely ignore the sculptural object. While sometimes this relationship becomes problematic, introducing an aesthetic realm that detracts from the formal play at hand, it also brings the plurality of McMakin's practice to each piece, introducing a complexity that provides an interesting counterpoint to the restraint of his conceptually-rooted studies. McMakin is a fine furniture designer, but his "art" projects are bad news. Artschwager-lite novelties that reek in the same way Peter Wegner, Hildur Bjornadottir, and every cardboard replica of a real object reeks. Seriously, do people still ask questions like "Is it a painting or a sculpture?" "Is it furniture or a painted sculpture of furniture?" "Am I an idiot for spending 10 dollars to come and see this?" There are times I'm really put off by McMakin. At other times (like this show) I enjoy the Juddian severity. That said space and furnishings do inform the art around them, why not shine a light on that kind of question? Because of that dynamic McMakin's work is best in living spaces, not museums. That said, look at this museum show then compare it to the great early Judd or even the Truitt in the Jubitz Center.